This past weekend, we ate supper at my in-laws. We actually spend most Saturday evenings there. Its always a fun time to get together and catch up on whats going on with everyone. My mother in-law, Connie, always makes a big, country supper. Common items on the table, especially during this time of year, is fresh vegetables. At any given meal you're likely to see beans (pintos or green beans), potatoes (fried, browned, mashed), corn (on the cob or cut off and cooked up in a skillet), fried squash or okra, tomatoes, cucumbers, and one of my most favorite things: lettuce and onions. Lettuce and onions, also known as wilted lettuce or killed (kilt) lettuce, is a delicious southern side dish. While each family has their own way of making it, most of us can agree that fresh leaf lettuce, onions, and bacon grease are always involved. Those of you who happen to read this blog who aren't from Appalachia may think this sounds disgusting but I'm fairly certain that you'd like it if you'd try it! Making this dish is super simple. First, you're going to want to gather some fresh, tender leaf lettuce. Wash, pat dry, and tear up in to smaller pieces. Next, chop up and add some onions. Spring green onions always seem to taste the best but you can add a regular ol' onion and it'll still be tasty. Now you're going to want to get some bacon grease. You can fry you up several slices of bacon, remove when crispy, chop up the bacon, and then add it and the hot grease over the lettuce and onions and toss to cover. Now if you sprinkle on some salt and pepper, you would be ready to enjoy your lettuce and onions the way I grew up eating them. When I got married and ate this dish at my husband's Granny Stalcup's house, I noticed that it had a little bit of a sweet taste to it. She told me that she added a splash of vinegar and sprinkling of sugar to it. It was delicious! My mother in-law happened to add a splash of pickle juice (basically the same thing) to hers and it is delicious too. You don't have to add fresh grease if you happen to save your bacon grease. Again, some of you folks that aren't from these parts may find this odd. Trust me when I tell you that this is a long standing tradition in Appalachia. Many meals were stretched by warming up a little of that precious pork grease, adding some flour and milk, and pouring this delicious gravy over some biscuits or even meat and potatoes. Most people pour their clean grease (try to remove any bits of meat) in a Mason jar or grease can. 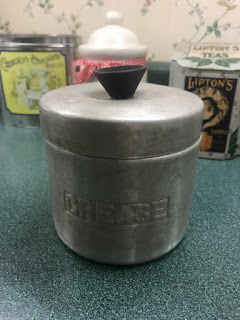 If you happen to save your grease, just warm some up and pour over your greens. This grease can belonged to Granny Stalcup. little tokens to remember them by. 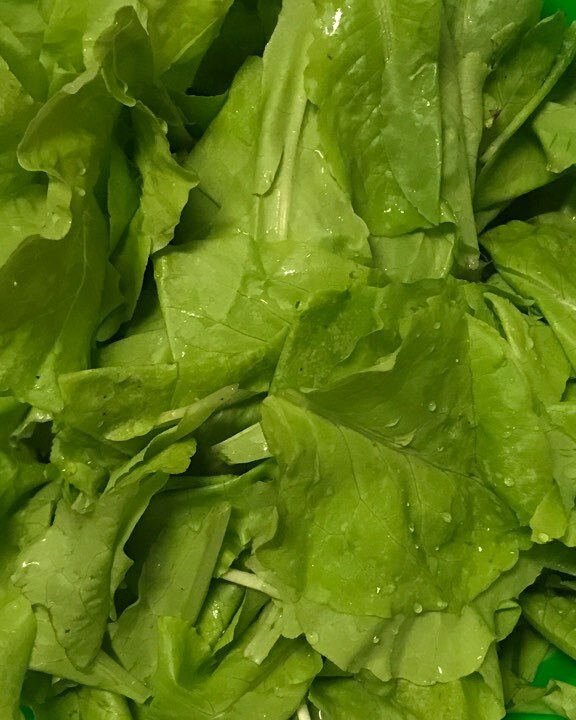 This is what The Encyclopedia of Appalachia had to say about wilted lettuce: "Although its origin is obscure, wilted lettuce, also called killed lettuce, has long been a popular and valued food in the region. Because a variety of greens thrive for months in Appalachia, the simple recipe can be used for much of the year. As a stand alone dish, wilted lettuce can be served in lieu of a salad before a meal. As a side dish, it is commonly served with pinto beans. Wilted lettuce is not distinctly Appalachian or American; greens were cultivated and eaten in this manner in Europe for many years prior to the arrival of the colonists in the New World. The dish has also been found in some Native American diets." Do y'all enjoy lettuce and onions? Does your family have a different recipe?